I could talk about tonight's 10-2 debacle in Arlington, but the only thing I'll say about it is that the Mariner Optimist won't be blogging anytime soon. But Corey, you're still welcome to post in the comments boxes. This is what happens when the Mariners play a GOOD BALLCLUB. Rush lead singer/bassist Geddy Lee threw out the first pitch before the ballgame. The Canadian Power Trio is in the Metroplex this week currently on their 30th Anniversary Tour. A shameless plug for a new Rush CD that will come out next week, titled "Feedback". It features covers of 1960s classics such as "Summertime Blues" and "For What It's Worth". Check it out, if only to hear Geddy sing "Summertime Blues". 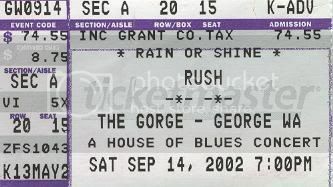 David and I have seen Rush live. They're the best live band I've ever seen. A band that has no opening act and plays over three hours deserves that title. ---The American Film Institute released their list of the 100 Top Songs from U.S. Films. Judy Garland's "Over The Rainbow" was ranked #1, and rightfully so. But of course, there are a few songs that should have been on this list. Phoebe Cates has left the pool. I don't need to go on here. Just one of the many hysterical scenes in "Wayne's World"
This track is probably too over the top for the AFI, but it was in an American movie. Scarface "No Tears", from "Office Space"
Seeing Michael Bolton (David Herman) sing along to this track is off the UCR scale. Yes, "Gonna Fly Now" is on the list. But what about the eye of the tiger? Did the experts who voted on this list not have the eye of the tiger? ---Bernie Bickerstaff will destroy the Charlotte Bobcats. He already destroyed the Washington Bullets/Wizards and the Denver Nuggets. Why not go for the trifecta? ---Why was Bickerstaff hired in the first place? ---The Tampa Bay Devil Rays have won 12 in a row. I predicted before the season that they would not finish in last place. I hope I'm proven right. ---I'll take the heat any freaking day over thunderstorms. Yes, you heard that right. But it's so true. The Arkansas heat is terrible, but it's better than thunderstorms. At least with the heat, you can control yourself, somewhat. With thunderstorms, you're at the mercy of mother nature. ---The KISS Scab Army is coming to Little Rock Sunday, August 8. I'll pass. Alright, that's it. Time to get some rest here. Don't hurt yourself trying to tell yourself that the Mariners can get back into the A.L. West race.